Based on some helpful feedback that I received on my previous post on textual criticism, I thought that I should write a follow-up post to clarify a few things. To begin with, I should state upfront that I’m a relative newcomer to the subject of textual criticism, and would by no means consider myself an expert. Rather, I’m relying on what the majority of evangelical NT scholars today teach about textual criticism. Of course being the majority doesn’t necessarily make them right (after all, that’s what I’m saying about the Majority Text, right? ), but having evaluated their claims for myself, I still find their overall case to be persuasive, so I don’t expect to give up my ESV Bible anytime soon! Also, there’s only so much that a blog post can cover in a couple thousand words. NT scholars have spent entire careers writing volumes on textual criticism, so at best I can only scratch the surface here. That said, I think I need to say a bit more in fairness to advocates of Byzantine priority. I’ve tried to portray them accurately and charitably, with mixed success. It’s easy to confuse criticism with hostility, but I hope that my words reflect the former rather than the latter. Further, it needs to be emphasized that Byzantine prioritists don’t all speak with one voice. And, in my opinion, some of them make a far more reasonable case than others. Perhaps it would be helpful to see them as lying on a spectrum: while some may be convinced of the inspiration or inerrancy of a particular translation, manuscript, or text-type, the position of many other Byzantine prioritists is more nuanced. It’s not so much the presence of any textual variation that they find to be theologically problematic, as the presence of a certain kind or degree of textual variation. That is a fair point. We need to get more specific about what kinds of variation are unacceptable, and why. To be sure, there is much greater uniformity among the Byzantine manuscripts; their differences are often so minor that they don’t even come across in an English translation. On the other hand, with the Alexandrian manuscripts we are talking about differences in entire lines, sentences, or even pericopes. But the point I tried to make in my previous post is that even textual changes on this scale are not contrary to Scripture’s own teaching on divine preservation, provided that 1) such textual changes do not compromise core Christian doctrines, and 2) they can be identified to a reasonable degree through the tools of textual criticism. Granted, this falls short of a “jot and tittle” standard of preservation. But many Byzantine prioritists have already conceded that even the best manuscripts are not preserved with that degree of accuracy. Clearly that cannot be what be what Scripture means by the doctrine of preservation. This highlights a more fundamental point: if our presuppositions put us at odds with a substantial amount of evidence, then that ought to signal to us that we may need to revise our presuppositions. In other words, I’m advocating a posture of critical realism. That brings me to the question of method. I mentioned only very briefly the standard text-critical principles of lectio difficilior potior and lectio brevior potior. Overall, I find these principles reasonable, when taken as useful guidelines rather than as absolutes operating in a vacuum. There may be cases when readings might plausibly become shorter and/or harder through copying. On the other hand, I think that Byzantine advocate Phillip Kayser misunderstands evangelical textual critics when he says that they “assume that the apostles would not have been capable of beautiful Greek” (Has God Indeed Said? pp. 15-16). Of course they were capable. They were inspired by the Holy Spirit. But it’s a question of what’s more plausible: that later well-meaning scribes would attempt to polish the rough grammar of the originals in order to clarify their meaning, or that “non-Greek” and “non-caring heretics” would degrade the grammar through sloppy copying? Even if we granted the existence of such heretical influences behind the Alexandrian text, are we really to believe that bad theology made them crude grammarians too? Why should we think that these supposed heretics were any less capable of writing polished Greek (or even just copying polished Greek) than contemporary Alexandrians like Origen and Athanasius? There is no evidence of a Byzantine tradition prior to the fourth century, nor are there citations of the Byzantine text from the church fathers prior to the fourth century… The earliest manuscripts of the NT are found among the papyri, and, of the 128 currently available, none of them contains distinctively Byzantine readings. Now there are a number of Byzantine readings alleged to have precedents in these papyri mentioned by Porter and Pitts, but there’s good reason to question whether these readings can even properly be called Byzantine. For example, Papyrus 46 (c. 200 AD) contains a “Byzantine” reading of Eph. 5:9: “the fruit of the Spirit” rather than “the fruit of light.” Does this reveal the influence of an early Byzantine text-type? Hardly. In fact, I don’t even think this reading has a genetic connection to the Byzantine text at all. Surely it isn’t hard to see how an Alexandrian scribe familiar with the term “fruit of the Spirit” from Gal. 5:22 could have inadvertently inserted the wrong expression here, quite independently of Byzantine influence. On the other hand, the phrase “fruit of light” is well attested in numerous early Alexandrian, Western, and even Byzantine manuscripts. This supports Gordon Fee’s contention that most of the Byzantine readings allegedly supported by the papyri are better explained as accidental rather than as genetic. That in turn raises the genealogical question: exactly when and where did the Alexandrian and Byzantine text-types originate? At present I’m persuaded of Timothy Ralston’s theory. He uses statistical analysis to show that the Alexandrian manuscripts tended to become less homogeneous over time, since the early papyri share the same readings more often than do the later codices. By contrast, the Byzantine manuscripts show the exact opposite trend, becoming more homogeneous over time. This suggests that, while the Alexandrian texts slowly diverged (through the accumulation of scribal errors and emendations) from a single “archetypal” tradition, there is no analogous Byzantine archetype. Rather, the Byzantine text-type appears to be the product of multiple traditions gradually coalescing. So which traditions would the Byzantine text-type have drawn from? One seems to have been the Alexandrian tradition itself, which would explain why Alexandrian manuscripts tend to agree with early Byzantine manuscripts (A, W, P) more often than with later Byzantine manuscripts (Ω, V, E)—these agreements would be expected to fade out as other traditions exerted an influence on the Byzantine trajectory. Another tradition appears to be the Caesarean (like Θ), which also tends to agree with early Byzantine manuscripts more often than with later ones—again, exactly what we’d expect if later Byzantine manuscripts blended together multiple traditions. The historical facts help account for this picture: following the Diocletian persecutions of the early fourth century, Emperor Constantine commissioned Eusebius to produce a number of Bibles, presumably based on manuscripts from his hometown of Caesarea. Then, as Greek fell out of use in the Latin-speaking West and as Muslim invaders conquered the rest of the East, Constantinople became one of the only remaining stable centers of manuscript production, thus consolidating various textual streams into a single localized tradition. By contrast, try to account for all of these facts on the assumption of Byzantine priority: why is it that the Alexandrian manuscripts tend to diverge over time, while the Byzantine manuscripts converge? Why is it that early Byzantine manuscripts agree with their Alexandrian/Caesarean counterparts more often than do later Byzantine manuscripts? And why don’t any of the church fathers before the late fourth century show an awareness of a Byzantine tradition (for example, see image below)? From my perspective, fitting all of these facts into the framework of Byzantine priority is like trying to fit a square peg into a round hole. To summarize, the decisive issue for me is prior plausibility and explanatory power. If we start from the general assumption of Alexandrian priority (allowing for some exceptions, when warranted), the evidence fits together quite nicely to form a coherent picture. The same cannot be said when we start from the assumption of Byzantine priority. Further, I don’t think Alexandrian priority is as theologically troublesome as many Byzantine prioritists make it out to be. That being the case, let’s not throw out our modern Bible translations just yet. Stanley Porter and Andrew Pitts, Fundamentals of New Testament Textual Criticism (Eerdmans, 2015), 117-118. Fee makes this point in his critique of Byzantine advocate Harry Sturz in Journal of the Evangelical Theological Society 28.2 (June 1985), 239-242. Of the 150 Byzantine-papyrus alignments proposed by Sturz, other textual critics have acknowledged the genetic significance of only about eight. This is enough to temper sweeping claims about the absence of any Byzantine readings before the fourth century, but not enough to support the existence of an early Byzantine text-type. Against these eight early Byzantine readings, there are hundreds of Byzantine readings that are found only in relatively late manuscripts. Ralston, “The ‘Majority Text’ and Byzantine Origins,” New Testament Studies 38 (1992): 122-137. 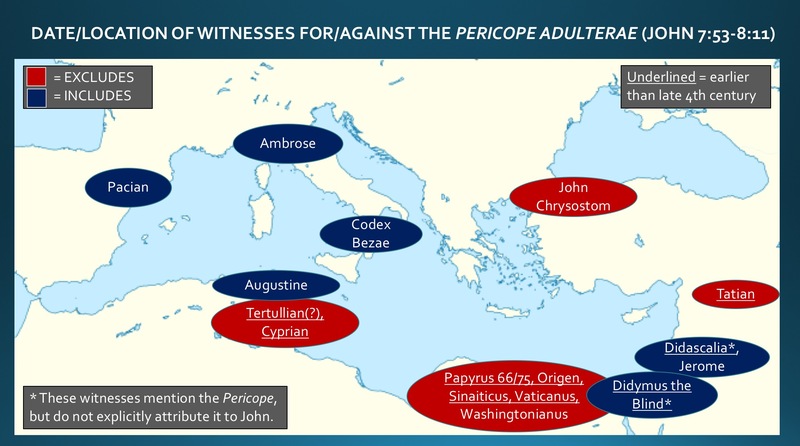 Sturz claims that this silence is due to the fact that we have no surviving patristic testimony from the region of Antioch, where the hypothetical “proto-Byzantine” text would have been in use. However, Sturz contradicts his own claim when he attempts to give positive evidence for Byzantine readings in the Egyptian papyri. He cannot simultaneously arugs that this proto-Byzantine text did and did not exert an influence outside Antioch. See Moises Silva’s critique of Sturz in Westminster Theological Journal 48.1 (Spring 1986), 187-190.